Twelve years later, I am back with my report on the durability of Euroflax linen yarn. What I am about to report may astonish you—indeed it astonishes me even as I gaze at the photographic proof. No filters, no retouching. Take a look. This isn’t one of those wimpy Consumer Reports laboratory tests. 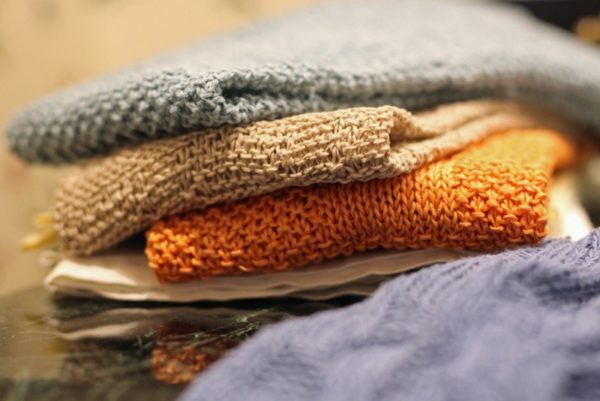 This is the real deal: twelve punishing years of hard and regular use of handknit items in an environment that can only be described as unforgiving, relentless, often involving toddlers, teenagers, and middle-aged men. No human-shaped dummies were involved—all stress was generated by human-shaped humans doing the thing that humans do: wear stuff down, Grand Canyon style. I experimented with hand towel pattern ideas, back in 2004. Since then, these four towels have been a constant amenity in our guest bathroom, aka the bathroom where you go when you really want quality time all by yourself, aka the most popular room in the house. What are you, Euroflax? Are you made of steely determination? Iron will? Pure grit? 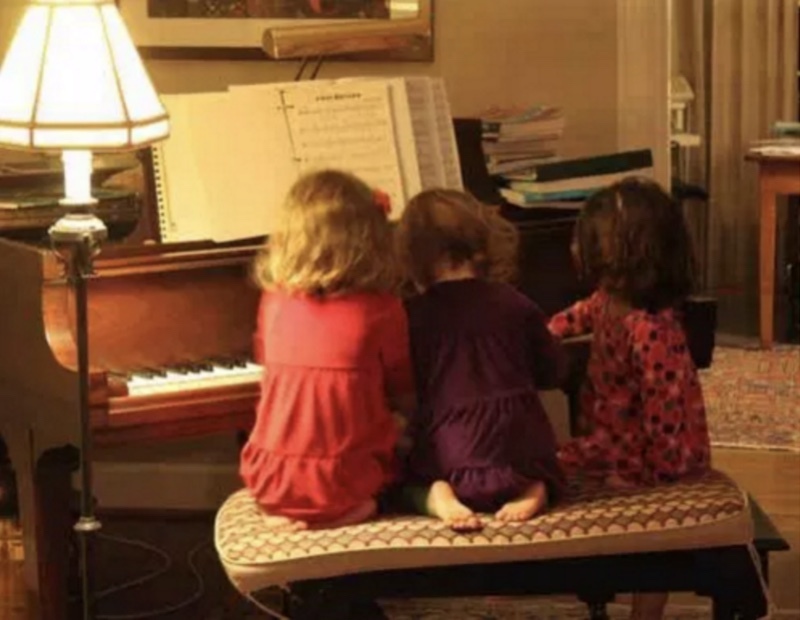 Hubbo plays the piano every single day. He comes home and starts playing whatever he’s got in his head. This piano bench is where he sits, every day. I made this cushion in 2004 as an upholstered tribute to Hubbo’s grandfather, who played a lot of piano in his day. (Story here.) Sometimes you just want to memorialize somebody with a cushion. 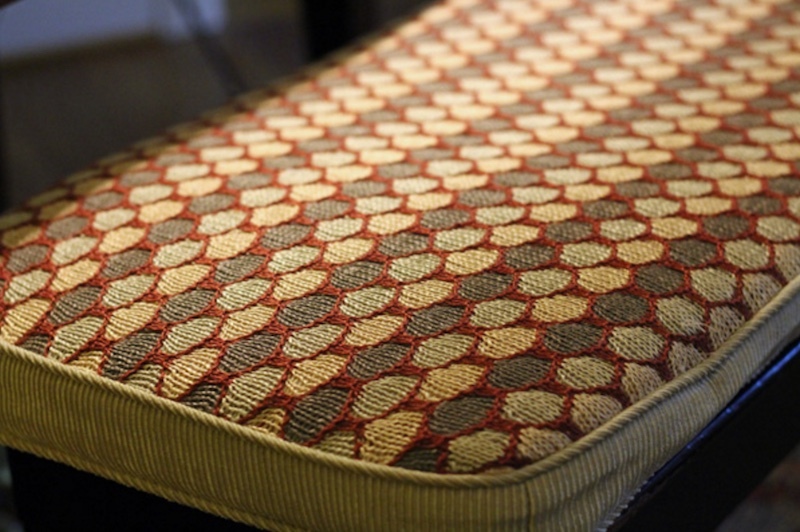 You will notice that the sides of the piano bench cushion are deflating a bit. 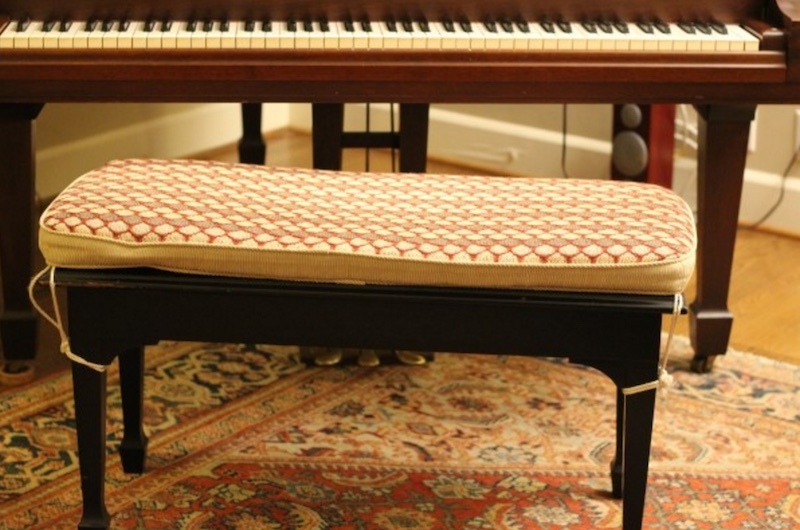 I’d go for a knife-edge cushion next time I make a memorial piano bench cushion. But what you’ll notice as well is that the Euroflax on top is not deflating, or tired, or stretched. It isn’t even worn. The colors are the same as the day I finished it. I find this completely amazing. I mention all this because everybody needs to understand that this yarn is for the ages. It will not fall apart. It will never die. Anything that you make with this yarn will last so long that your grandchildren will dig it out of your antique Container Company wicker storage bin a hundred years from now and screech with delight at the perfection of Grandma’s taste in yarn. Oh Lord that is a CUSHION! Please post the pattern and I will buy all the mini skeins needed! Wow wow wow. I second the pattern request. I’ve admired this bench ever since you first made it! I made these towels when the book first came out…made many, many of them (they are addictive) and I can say that they are more beautiful now then they were at the beginning. I love using Euroflax!! Maureen mentioned making the towels “when the book first came out”. What book? Is it still in print? I want one! Particularly if it includes the bench cushion. Just received the Snippets email and it looks like it’s going to be regular Saturday reading. Wow!!! Thanks for the update on these two favorites from Mason Dixon Knitting ( still my favorite knitting book after all these years! And the projects are still as fresh today as they were when the book came out ). 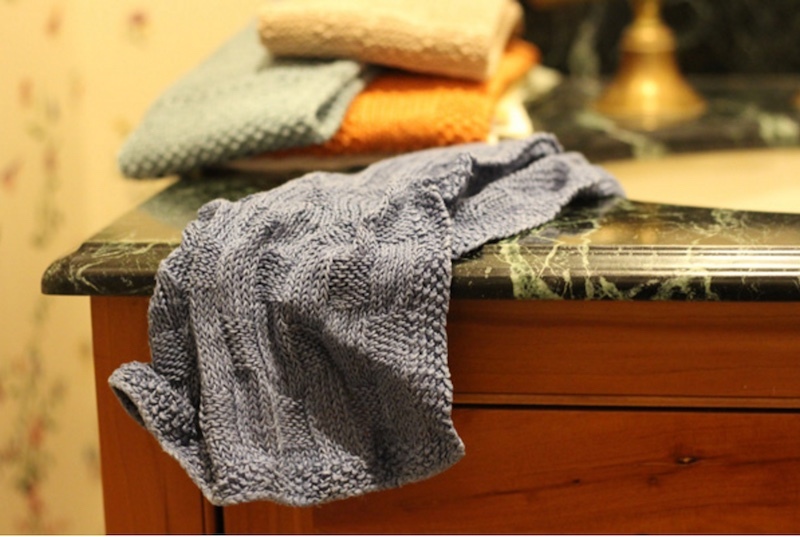 This post has inspired me to finish up those Euroflax guest towels I started a few years back but never finished. Then I can order more in those beautiful new colors! Loved this post! Hand towels! I was intrigued by the idea when I read the book way back when, but this post inspires action! Love love Euroflax! It’s so soft and drapes beautifully! And knitting towels is such a lovely task, I am delighted that other knitters feel the same! 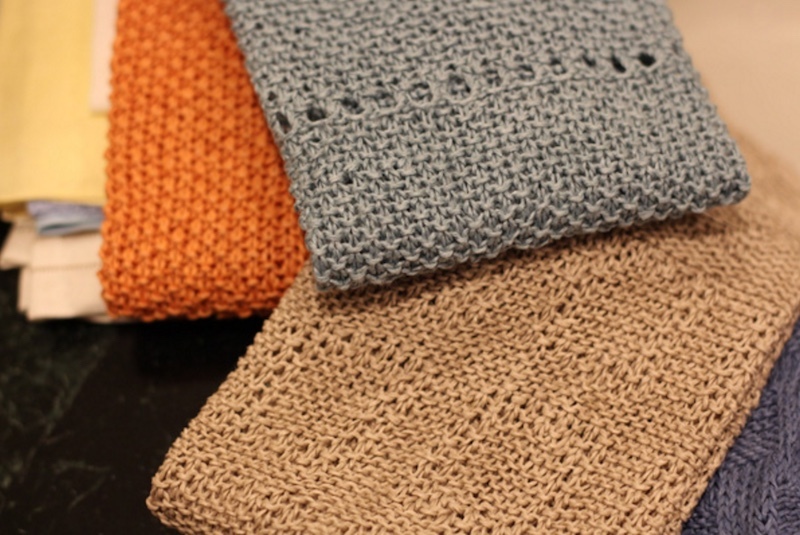 It’s my go-to when I design scarves for my friends who have wool allergies. ARGUH! I remember these towels, bought the book, bought the yarn, and all are in a storage unit in Colorado which is on the other side of the world from me. And Euroflax is awesome. I have a top that I knitted way back in the early mid 1980’s (I think) and it always looked brand new. How many skeins of Euroflax does it take to knit a bathroom hand towel? My grandchildren go thru the pretty fast. I love this yarn! I love knitting with it and love wearing it and yes, towels are wonderful as well. Is the book still available? Suddenly, I have a strong desire to knit hand towels. Are you saying that in 14 years you always air dried hand towels and not once did one of them sneak into the dryer by accident? What happens to euroflax in the dryer?